Sisters, Sisters, there were never such devoted sisters. We can’t wait to see that number! 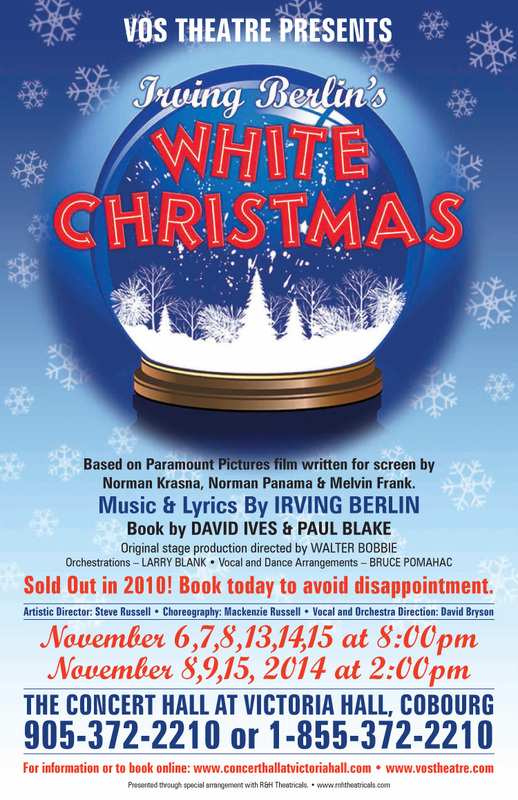 VOS recently asked Marlena Sculthorpe and Mackenzie Russell (Betty and Judy Haynes) to tell us about their experiences preparing for the VOS Theatre production of White Christmas, running November 6 to 15 at Victoria Hall in Cobourg. VOS: So ladies, Judy and Betty in White Christmas, huh? Normally a pairing onstage is with the romantic interest. I bet it’s fun to have a sister. Marlena Sculthorpe: Especially if you’re an only child and never had a real sister! Betty and Judy are a dynamic pair. Betty is the older, more conservative and often protective sister, while Judy is the fun loving, free spirited younger sister. Nothing sums up their relationship better than in their famous number, “Sisters”. Mackenzie Russell: It is fun! Marlena has been so awesome to work with and has really helped me as this is my first time ever in a musical where I have a principal role. The most I’ve ever had is about 5 lines – not to mention the songs! So this has been a huge challenge and Marlena is a great mentor, and sister! She has really just been awesome to work with. VOS: Mackenzie you’re doing double duty as choreographer. It’s a huge undertaking and yet the cast just raves about the three hour choroegraphy session. No complaints. They’re loving it. How do you do it and how long have you been dancing? Mackenzie: I don’t know how I do it! It’s been a crazy challenge but it’s a lot of fun. I have the best group of dancers to work with which makes the whole process so enjoyable. They are at a variety of skill levels but they all work so hard and help each other. It’s a great atmosphere. I’ve really tried to push the dance chorus to reach their full potential and do things they never thought they would. I also try to keep the rehearsals as fun as I can while whipping them into shape! I want each person to feel successful and accomplished after wowing the crowds and hearing the applause. Hard work does pay off and I can’t wait to see the final products. As for me, I’ve been dancing since about age 4 At studios and schools, university and now as a high school dance teacher. I try to spread my love of dance onto future generations. I can’t get enough and am glad to have the opportunity to have this exciting new challenge with VOS. VOS: So, Marlena, second time around; same role. You were spectacular in this show. What’s it like taking on the role of Betty for a second time. Marlena: Taking on the role of Betty for a second time around is much different than I expected. I assumed it would feel and look a lot the same, but it really doesn’t. We have amped up the dance numbers and this time around I get to participate in 2 of them that I wasn’t onstage for in 2010. It is nice to come back to a role because things like the lyrics and the lines come back a lot faster than learning something from scratch. My blocking is different, my costumes are different , and even parts of the show that I’m onstage for are different. It’s a whole new fresh take on the show. VOS: Ladies – what’s the greatest challenge with this show and these roles? Marlena: I would say the challenge this time around is in the dance numbers. Mackenzie has put together some stellar choreography and we have a great dance chorus. One of my favourite parts of musical theatre is the dancing – as an audience member and as an actor. It really livens up a show. These dance numbers will be an audience favourite, I can guarantee. Mackenzie: I’d say my greatest challenge is actually the acting as well as the ballroom partner dance because it’s a style I don’t have much experience with. But both are going well so far! VOS: Did you watch the movie when you were a kid, Marlena? Was it a part of your family tradition. Marlena: I didn’t… I did watch the film once before the production in 2010. I was more of a “Meet Me in St. Louis” kinda gal. The story line in White Christmas remains the same, but there are some great Irving Berlin tunes thrown into the stage version that don’t appear in the movie. If you’ve watched the movie a thousand times, you’re going to find new things to enjoy in the stage production. If you haven’t seen the movie, you won’t be lost! VOS: So, Mackenzie – so you’re working with your Dad again. You were both in the cast of Shrek but is this the first time you’re worked with him as a director? Mackenzie: Yes. This is the first time I’m working with him as a director. I’ve actually had him as my teacher before but never as director. It’s lots of fun to see him in action doing what he loves. It’s a great bonding experience and he’s very encouraging and has had great advice throughout the process which is always helpful. VOS: Marlena – you’ve worked with Mr. Varty (Bob) on Vimy, Oklahoma, Shrek, On the Rooftop since you met him in 2010 the first time you played Bob and Betty. How is this rehearsal process different for the two of you? Marlena: The last time we did this show, it was only my second major role and I hadn’t done musical theatre in 8 years. I was more uptight and nervous about the rehearsal process, remembering lines and not looking like an idiot on stage. For me, it feels more organic this time around. Because the lines came back much faster, we were able to get into character much faster. It’s also easier to work opposite an actor that makes you feel comfortable. We are able to say to each other “that doesn’t work” and no one is getting their knickers in a twist. I always tell Joel what I’m thinking and I think he does the same to me. I’m very much like that in real life. I’m a very bad liar. Don’t miss your chance to see Marlena and Mackenzie as the Haynes sisters in White Christmas this November 6th to 15th! Call for tickets (905-372-2210) or see the VOS website for more information. 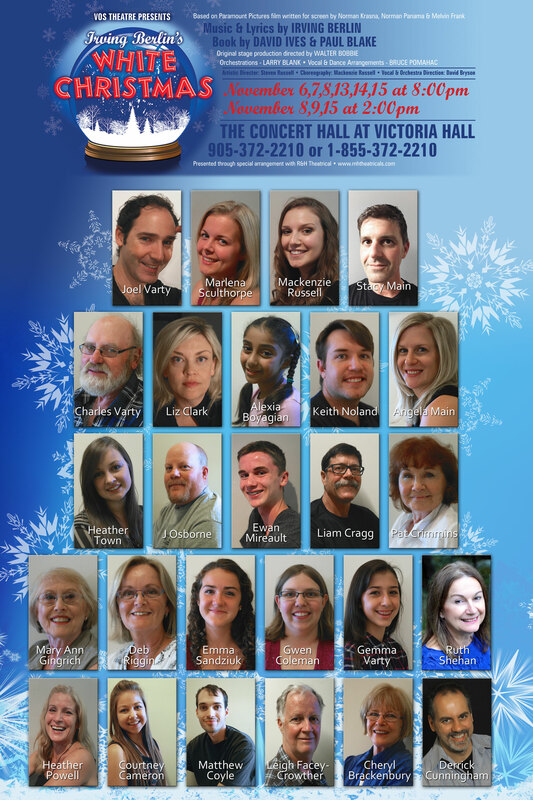 VOS sat down with long-time producer Liz Clark, co-producer and Martha in White Christmas, running November 6th to 15th at Victoria Hall in Cobourg. VOS: So how long has it been since you’ve been onstage? I think the last show I did was Kismet with my buddies Blair McFadden and Hugh Stewart but I’m so old I can’t remember when that was. It’s all a blur. VOS: Why did you take such a long break? VOS: Are we having fun yet? LC: Rehearsing? Scary fun perhaps. Like that kind of fun when you’re on the top of the roller coaster and you think “what the hell was I thinking getting on this ride?” Then, by the time you realize you didn’t wet your pants in public you get that you have had fun. I’ve never been a person who has loved the rehearsal process. I’m not good at it. I don’t even particularly love to sing or perform. But what I love is getting something – a line, a song, a bit – just right, finessing it according to the energy of the audience at that specific performance and feeling or hearing them respond. That’s fun. That’s to come, I hope. VOS: What made you want take on Martha from White Christmas? LC: Two things. I’m no Mary Wicks – I don’t have that kind of timing. So it had to be something other than the chance to play the old lady behind the desk. Martha’s music is great. But, the opportunity to work with Steve Russell as a director was a motivating factor, probably the biggest. I worked with Steve on Spamalot and Shrek and have such incredible respect for his work as an actor, his process and the way he treats his fellow actors, I knew I could really learn from him. He’s spent his career teaching children so I knew he would get me. Anytime you get the chance to work with David Bryson as music director you just jump at it. No questions asked. He is the most supportive guy I ever worked with as a performer. If you can make David smile you know you’ve done something right and it feels great. The chance to be a member of a cast was huge too. I produce in a way that allows me to be very close to the casts I work with, but until you’re digging your false eyelash out of your bra in a room full of actresses twenty seconds before you’re needed onstage you just aren’t “one of the guys”. I missed that. Oh, oh and this time I wanted to be onstage with my friends when it snowed! Wait that’s four things. VOS: You’re wearing three hats, co-producer, costume designer and actor? Which is the most challenging? LC: Well that was dumb, huh? If not for my dear friend Florence Fletcher I would not have the chance to be a cast member in this show. She agreed to co-produce and is carrying the bulk of the responsibility. Costume designer, now that’s an overstatement. I am fortunate to be able to use some of the costumes that designer Ann Hancock brought to the 2010 production but we have bigger dance numbers, actors of different shapes and sizes and a new director – a new show! So the costumes are not simply recycled. Most of the costumes for the 2014 production are new. They are my idea of classic musical. Suits fit well, sequins sparkle, shoes are important and where there’s Christmas there is satin and velvet. Most challenging? That would be learning that some days I will be a decent cast member, some days I will be a competent producer, other days I’ll solve a costuming issue but never all three in the same day and being ok with that. The people I am working with have made it easy to learn that lesson because they’re very forgiving and supportive. That’s what community theatre should be about. VOS: VOS is often described as an organization that puts people first. How is that exemplified with this production? LC: The script itself and the movie focus on relationships. Bob and Phil put the General’s needs above their own, the soldiers come to the inn for Christmas rather than celebrating in their own homes because the General is their family. Martha takes care of him because she knows beneath his crusty exterior there’s a big heart. Betty falls in love with Bob because he shows her that he is the guy who gets all of that. This type of script tends to attract people who want to have fun and travel back to a time when the holiday season was about sharing the good stuff. Those people tend to be generous actors and pretty decent humans. Steve, Florence and David are leaders who respect what folks are trying to accomplish and their individual strengths. Mix that all together and it’s a recipe for a pretty wonderful time. VOS: You co-produced the 2010 production and you’re co-producing again. Why? Do you have an attachment to it? LC: I wanted to be Rosemary Clooney when I was a kid. That voice was velvet. That iconic black dress designed by Edith Head – I wanted it. I remember watching it at Christmas in the living room, laughing at Danny Kaye, loving Bing’s voice, marveling at how anyone as stick thin as Vera-Ellen could even stand up. It’s just Christmas to me. Holiday Inn, The Grinch be damned. I’m White Christmas all the way. I’ll be honest, I was enthusiastic about this project because the 2010 production was so special. It re-energized an organization that made a substantial contribution to my quality of life. It brought new people to the forefront of VOS Theatre. I made great friends. This is a new production and I am thrilled by the challenge. It is different in so many wonderful ways, but the same in that, like the 2010 team, the folks I’m working with seem to have that same appreciation for what can be created when attention is paid to the work, the goal and the respect for each other. In other words, they understand magic. VOS: What should people look forward to in this production? LC: Notwithstanding what I just said about the great cast, if I start naming names and forget someone I’ll end up opening night with my shoes missing. Every producer gushes at some point but I kid you not, the dancing is spectacular. 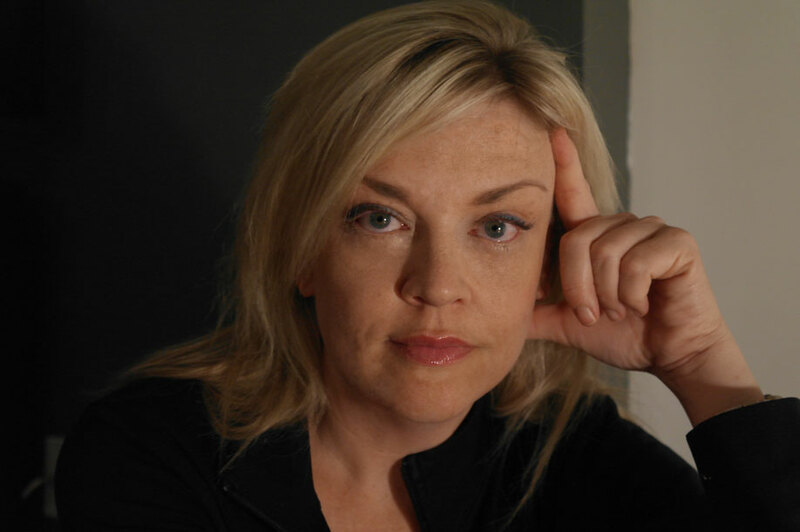 Choreographer Mackenzie Russell has done incredible work. The tap number, I Love a Piano and Blue Skies will blow you away. The voices – Ms. Sculthorpe, Mr. Varty, Mr. Main and Ms. Russell are very special – glorious. Charles Varty, our General, is the original story teller and his General is lovely. That moment when the soldiers sing “We’ll follow the Old Man”……can’t you just feel it? So there’s great music, a live band made up of the area’s finest musicians, amazing tap, sequins, Christmas and SNOW all inspired by one of the most popular classic movies ever filmed. Look forward to that! Start your Christmas season with that! 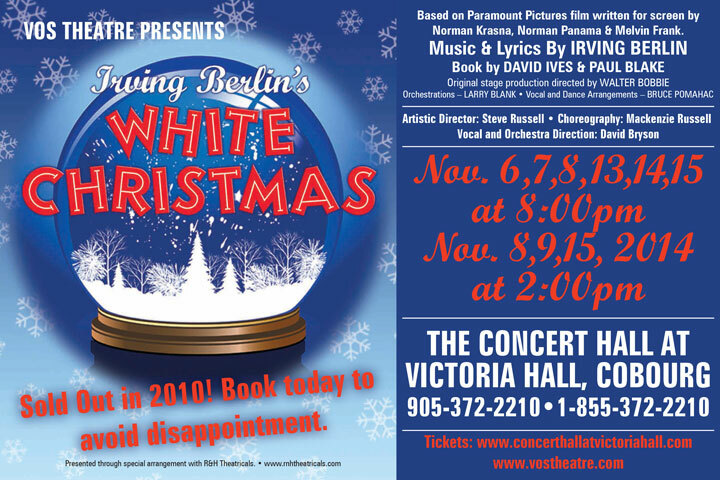 The VOS Theatre Production of Irving Berlin’s White Christmas runs from November 6-15 at Victoria Hall in Cobourg. Call the box office for tickets today at 905-372-2210. Tickets are going very quickly! The Cast of White Christmas!